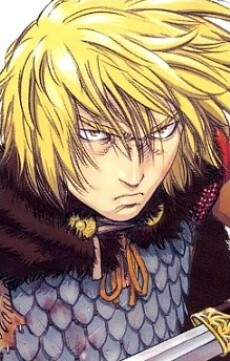 Thorfinn is a courageous young man armed with two twin blades he inherited from his deceased father. He's traveling with Askeladd, who is the leader of a ruthless group of mercenaries who take jobs from whoever they think can offer them a reasonable reward. Besides, Askeladd is the man who killed Thorfinn's father, Thors, and the only reason Thorfinn is traveling with Askeladd is so he can defeat him in a duel and win back his father's pride. Thorfinn only wants to win his father's pride with a fair duel. Askeladd only agrees to these duels when Thorfinn completes a certain task (like bringing him the head of the opposing armies general on the battlefield). He does not fight for the love of battle, but is still prone to losing his composure when in combat. This hotheadedness often costs him battles against more experienced opponents. After Askeladd is killed, Thorfinn entered a rage and tried to kill Canute, which resulted in him being sold into slavery and bought by a farmer. Voiced by Shizuka Ishigami during his childhood phase in the anime.